According to a new market research report published by Transparency Market Research titled ‘Industrial Radiography Equipment Market – Global Industry Analysis, Size, Share, Growth, Trends, and Forecast, 2019–2027,’ the global industrial radiography equipment market was valued at US$ 574.8 Mn in 2018 and is expected to expand at a CAGR of 6.75% from 2019 to 2027, to reach value of US$ 1,032.7 Mn by the end of the forecast period. Industrial radiography is increasingly being used in various sectors, such as aerospace & defense, semiconductor, and oil & gas, in order to ensure the structural integrity of products and identify faults, if any, in the manufacturing of components. This is projected to augment the demand for industrial radiographs across the globe. This, in turn, is likely to fuel the industrial radiography equipment market during the forecast period. Over the last few years, the semiconductor industry has been flourishing across the globe, especially in developing economies such as China and India. There have been several technological advancements in the field of semiconductors as the size of electronic components continues to shrink and the demand for high-performance products with increased efficiency in terms of power consumption is increasing. The shrinking size of components makes it difficult to conduct quality tests on components such as printed circuit boards (PCBs), wafers, plug contacts, and wiring. With the help of industrial radiography, it is possible to carry out nondestructive analysis of electronic components such as surface-mount devices (SMDs) and column grid arrays; to identify solder bumps in ICs; and to study the thickness of materials coated on PCBs. Industrial radiography is increasingly being used in the semiconductor sector by key players engaged in the manufacture of electronic components in order to ensure high quality and efficient performance. Based on imaging technique, the global industrial radiography equipment market has been divided into film-based radiography and digital radiography. Furthermore, the digital radiography segment has been sub-segmented into direct radiography, computed radiography, and computed tomography. Owing to high quality of images generated with the help of digital radiography, the digital radiography segment is expected to expand at a rapid pace during the forecast period. High quality of images makes it possible to better analyze the quality of components under consideration. In terms of geography, the global industrial radiography equipment market has been segmented into North America, Europe, Asia Pacific, Middle East & Africa, and South America. In 2018, North America was the leading market, followed by Europe. 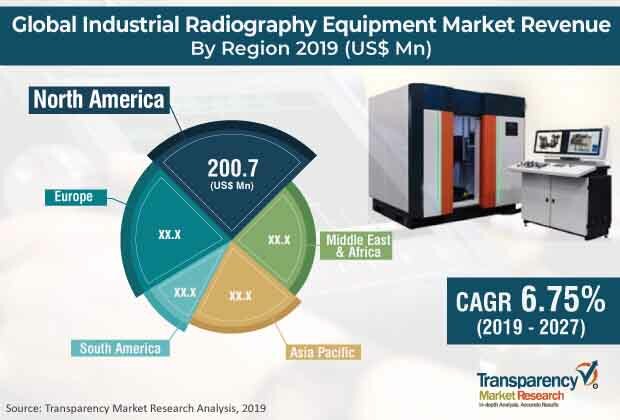 The market in Asia Pacific is expected to expand at the maximum CAGR from 2019 to 2027, due to rising popularity and growing adoption of industrial radiographs across various sectors in the region. Key players operating in the global industrial radiography equipment market are focusing on the development of new products and their introduction in the market to gain a competitive edge and improve their brand positioning in the market. For instance, in November 2018, Fujifilm Corporation announced that it would be adding two new digital radiography (DR) detectors i.e. the Calneo Dual (available only in Japan) and the FDR ES to its portfolio of digital radiography solutions. Furthermore, major players are engaged in forming strategic alliances with peers and less established players in order to gain market share. Key players operating in the global industrial radiography equipment market are Fujifilm Corporation, Comet Group, Shimadzu Corporation, Nikon Corporation, and North Star Imaging.